DVD's, computer cd-roms and more. 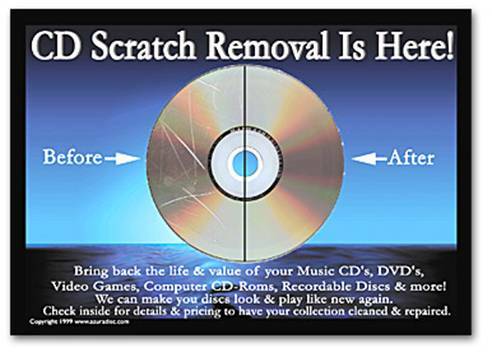 Have your scratched CDs repaired by a professional technician now! As long as the label side of the CD isn't damaged and there are no cracks in it, most CDs can be repaired! CD's look new and shiny clean when completed. No one will ever know a repair was ever done. Imagine how much the value of your video games will increase once we restore them to new condition! If you are considering sending us your discs it is very important to check both sides for any cracks or label side damage. Label side scratches show all the way through and cannot be repaired. Data where a label side scratch appears is lost. The CD will still work assuming the data in that spot isn’t needed but may skip or freeze if the laser eventually needs data from that spot. Hold the disc up to a bright light, with the shiny surface facing you. If any specs of light show through the disc then data in that spot has been lost and the CD cannot be repaired. IT IS VERY IMPORTANT YOU CHECK FOR THAT BEFORE SENDING YOUR CD’S IN. YOU ARE WASTING TIME AND MONEY SENDING IN CDS THAT ARE UNREPAIRABLE. 100 and up call or e-mail for bulk pricing. NOTE:  Double sided CDs can be done but they count as 2 CDs if you want us to do both sides. We can replace your standard size CD jewel case with a new one for .40 each. Sorry no doubles or larger size cases. If you want your CDs to be returned via express mail or insured, w/ tracking etc. this costs more. E-mail or call. Mail your CD's to our repair center (the address below) along with payment. Check, money order, or credit card #. If you prefer to use paypal specify that and we will contact you with the total when we get the CD's and they are ready to be returned. Include your name, address, phone, e-mail and a simple note saying "please repair these CD's"
Turnaround time is typically 1-2 days. It is that easy!! I can’t stress this enough. We cannot repair CD's with cracks or scratches to the label side of the CD. There is no process that can restore damaged or missing encoding from the label side. It is important to screen your discs carefully before sending them in for repair. If you send us a CD that can’t be repaired we will contact you to let you know. You will have to pay return postage if you want it back. We are not responsible if your package is lost or damaged in transit, use whatever shipping method you are comfortable with. We are not responsible for cracked jewel cases; pack your CD's adequately. Original cases are not necessary, use whatever is lightest weight to keep your postage costs down. Paper sleeves or slim cases are fine. Whatever cases or sleeves you send them in, the CDs will return in the very same cases. The #1 question we get asked – I can answer it now. “Are you still doing CD repair?” YES WE ARE!! Today, tomorrow and every day.